Dr. Simms-Waldrip received her undergraduate degree in Biology from Texas Christian University and her medical degree from the Texas Tech University Health Sciences Center. She then completed both her pediatric residency and pediatric Hematology/Oncology fellowship at the University of California, Los Angeles. Her research in the Koh Lab focuses on translational studies in pediatric SCT patients — studying the role of the gut microbiome in the development of invasive infections, GVHD, and host anti-tumor response. 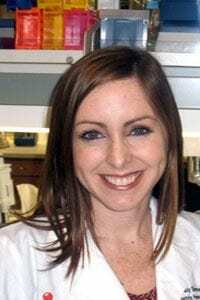 Outside of the lab, she enjoys running and spending time with her husband and two boys.